Swallow Press first published Winter of Artifice in 1945, following two vastly different versions from other presses. The book opens with a film star, Stella, studying her own, but alien, image on the screen. It ends in the Manhattan office of a psychoanalyst — the Voice — who, as he counsels patients suffering from the maladies of modern life, reveals himself as equally susceptible to them. The middle, title story explores one of Nin’s most controversial themes, that of a woman’s sexual relationship with her father. Elliptical, fragmented prose; unconventional structure; surrealistic psychic landscapes — Nin forged these elements into a style that engaged with the artistic concerns of her time but still registers as strikingly contemporary. This reissue, accompanied by a new introduction by Laura Frost and the original engravings by Nin’s husband Ian Hugo, presents an important opportunity to consider anew the work of an author who laid the groundwork for later writers. 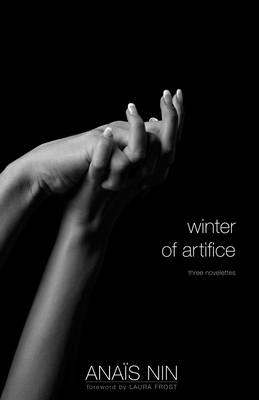 Swallow Press’s Winter of Artifice represents a literary artist coming into her own, with the formal experimentation, thematic daring, and psychological intrigue that became her hallmarks.